Astonishing but true: The mighty CODE. 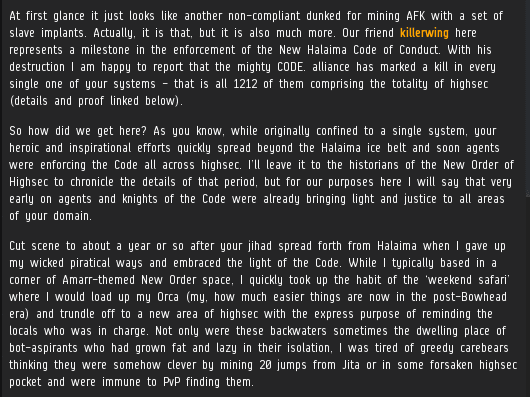 alliance has killed Code violators in each and every one of the 1,200+ systems of highsec. That's a lot. Sometimes I forget just how many systems I own. I've been aware of Black Pedro's kill-tracking project for quite some time. What an achievement to unlock! Imagine all of those miners thinking themselves clever by mining in obscure, out-of-the-way systems, only to give our Agent the satisfaction of scratching another system off of his list. Few people can know highsec geography as well as Black Pedro does, having undertaken such an enterprise as this. Here's a link to his spreadsheet. 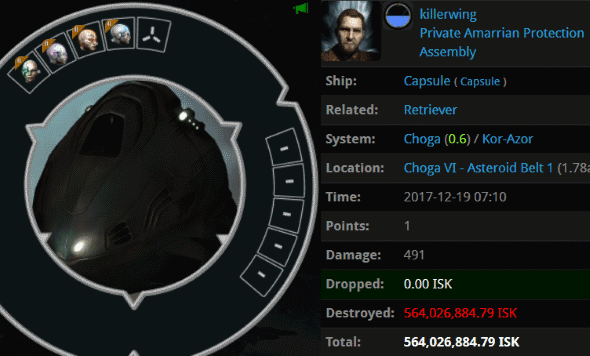 There is truly no place in highsec for the bot-aspirant to hide. Whilst my own investigation of the 'Mayonhen' island of Aridia unearthed a colony of remarkably strange and diverse highsec miners, a series of observations of the tiny island of 'Maal', bordering Fountain, gave the impression of a wilderness too inhospitable to support even the most obstinate form of miner life. But how wrong my findings were - these miners have seeded themselves as far as Zaveral and Keba! It is good to see our Agents have restored these systems to their previous state of pristine natural beauty. aight show-off, were you looking at dotlan? 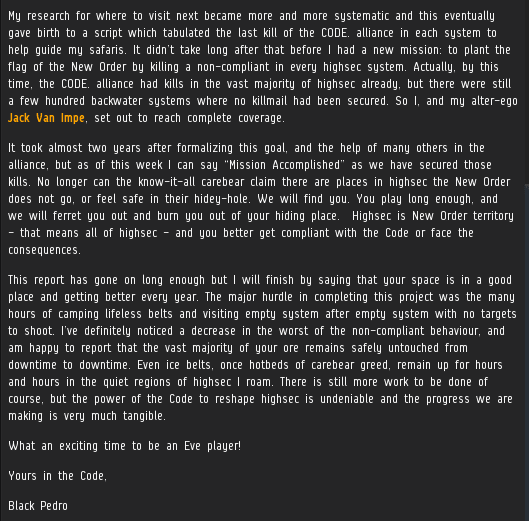 Another great example of the creativity of New Order Agents in bringing emergent gameplay to the whole highsec community. I'm very jealous that I didn't think of this first. BP will have to share some of the more interesting interactions with us as his enforcement actions must have been spectacularly unexpected and poorly received by the miners. Finally, I realize the transient nature of appearing in the spreadsheet but I'm proud to see Spine Ripper as the Agent associated with Kino. Congrats to Black Pedro on a very impressive achievement. Great job Agent Pedro! I bet there were some suprised carebears out there in those backwater systems. https://m.youtube.com/watch?v=fhcflDSUMvc just in case you carebears didn't get the message. The Code always wins! In every highsec system! Great work everyone! I quite enjoyed finding my name, thanks for this! What a magnificent accomplishment. I had no idea James 315 Territory was so vast. It's always been 'all of highsec'. None of the high sec systems belongs to code, that's why its not marked as codes on any of the territorial control maps. Your james does like the rules of the game, instead he just enjoys having his minions kill kids.